The Wound, Ostomy and Continence Nurses Society™ (WOCN®) Society adopted the American Nurses Association (ANA) position statement regarding the order of credentials and certifications for professional nurses, which explains the proper listing for credentials and recommends that nurses only list nationally recognized credentials. It is critical for nurses to correctly and proudly display their credentials and certifications to distinguish their professional and educational value and elevate their level of expertise. The Society and the Wound, Ostomy and Continence Nursing Certification Board (WOCNCB®) collaboratively developed a joint position statement to clarify the proper usage of the WOCN® acronym and WOCNCB® credentials and educate the wound, ostomy and continence (WOC) community in an effort to protect each organization’s name, brand, or logo from being used to create an impression of a relationship when one does not exist. The Society and the WOCNCB have taken the time to ensure that nurses are recognized as the highly qualified professionals that they truly are! We sincerely hope you find this position statement informative and welcome any comments or concerns you may have. For more information, please see the WOCN Registered Trademark Use Guidelines Position Statement. Thank you for your continued commitment, enthusiasm and support to both the Society and the WOC specialty. Thank you for being a WOCN Society member! We want to make sure you are utilizing the wocn.org features and Society member benefits to your full advantage. To better acquaint yourself with wocn.org and member benefits, please view the following video demonstrations led by our very own Nurse Nancy. • Signing into the member center. • Retrieving a forgotten password or username. • Making changes to your profile information, including contact information for mailings, invoices and journal subscriptions. • Viewing payment history, printing receipts, paying open membership dues/invoices, etc. This tutorial will provide an in-depth look at the Society’s most utilized benefit – the Members-only Forums. Learn how to connect with more than 5,000 WOC nurses to send and receive important clinical information. • View past conference sessions. • Access certification review courses and more. • The document library (position statements, reference guides, best practices and more). • Clinical tools and more. All of the materials provided are available to help you advance your practice. • Archived issues and current issues. • Articles published ahead of print. If you have any questions, please contact us info@wocn.org. The Society does not endorse or support products or services. This is a guest blog post written by ostomy patient and advocate, Dawnette Meredith. If you have a story you would like to share, please email share@wocn.org. This is me, a 50-year-old woman completely thrilled about a very expensive stuffed bunny from overseas. Ridiculous you say? Well, this is a very special bunny. It has an ostomy just like me! I underwent ostomy surgery in December of 2016 after battling severe colonic-inertia for 49 years, 9 months and 15 days. My bunny was a bright spot in my recovery. It was a daily reminder to smile and laugh at an otherwise less than ideal situation. For heaven’s sake, I’m a grown woman, but there I was showing off my stuffed bunny to family and friends! It somehow made it easier to talk about my illness and recent surgery. This little bunny sparked in me a hope to pass along positivity to other ostomates, and a dream to give children in the United States who undergo ostomy surgery a teddy bear with an ostomy. I designed a Teddy bear with a red button for a stoma and a removable Velcro ostomy pouch. Awesome Ollie the Ostomy Bear was born. There’s no better place to start than in your own back yard. Rady Children’s Hospital, near my home in San Diego, which performs roughly 120 ostomy surgeries per year, was the perfect place to begin. I know from personal experience that ostomy nurses are essential to helping patients recover and cope after ostomy surgery. My husband and I sponsored eight Awesome Ollie Ostomy Bears and delivered them to the ostomy nurses at Rady Children’s Hospital. The ostomy nurses were given the joyful task of handing out the bears to their ostomy patients. The response was overwhelmingly positive, and soon Rady Children’s Hospital called for more bears! Soon, other children’s hospitals wanted to acquire the bears for their ostomy patients. I quickly needed to find a way to get bears sponsored in time for the holidays! I approached my ostomy support group and its members with the possibility of sponsoring the bears for Rady Children’s Hospital. Within 20 minutes, over 30 bears were sponsored! Wow! I hurried to prepare the bears before Christmas-time. I like to think of myself as “The Ostomy Elf” busily working in my teddy bear workshop. In a flurry of fabric and thread, the bears were ready. The second batch of sponsored bears was joyfully delivered to Rady Children’s Hospital in December 2016. It’s a new year and Awesome Ollie the Ostomy bear has BIG plans! The goal is to secure funding and provide free Awesome Ollie Ostomy Bears to children’s hospitals all across the United States. 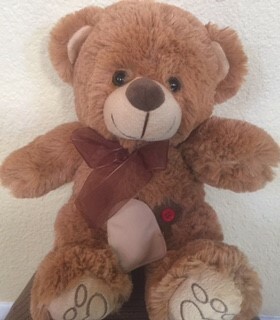 If you or your organization would like to sponsor Awesome Ollie Ostomy Bears at a hospital in your area or purchase a bear for yourself, please contact me at Terrabusy@yahoo.com or 858-336-4418. Awesome Ollie sponsorship costs $20/per bear. Find Awesome Ostomy on Facebook to keep up on all the Ostomy Bear news. When I first got my ostomy, I felt very alone. I felt self-conscious of the smell and sound, and sometimes I longed for my old body. When I couldn’t take self-loathing anymore, I decided to make friends with my ostomy. I reached out. I inquired about support groups in my area and realized there are many people like me. I realized my ostomy is a beautiful thing and has enabled me to do all the things I’ve been able to accomplish over the years. It is my uniqueness. When I saw that I’d have to live life with a bag stuck to my side, I assumed I’d be “fragile” for the rest of my life. But believe it or not, there are so many activities for ostomates out there! Swimming, karate, ballet, yoga — I’ve done everything I did before my ostomy and more. I was privileged to be the Eastern regional recipient of the Great Comebacks award and meet five other amazing ostomates doing incredible things. There is a huge, supportive ostomy community, including celebrities! Did you know Great Comebacks was founded by a former NFL linebacker? Stay informed and know the facts. The more I actually understood how an ostomy worked, the more I realized how wonderful it was. After that, I took it as my responsibility to educate others. Instead of wondering if I was being “judged” by others, I took it as a privilege to inform them. Take care of your full self: emotional, spiritual, mental and physical. If you’re stressed you might get physical side effects, such as being bloated or feeling pain and discomfort. Remember to take deep breaths in difficult times. If you’re just getting comfortable with your ostomy, remember that your support system loves you for who you are. You are more than your ostomy. Reach out to the ones you love when you feel alone, and never forget how loved you are. Throughout these years, I’ve been strong, determined and willing to do whatever it took to stay alive. I’ve dealt with tubes, bags, poles, you name it. And if this ostomy is all that I’m left with after everything, then I am truly grateful. More than that, I thank my ostomy for enabling me to live life to the fullest, to my fullest. I call it my Harry Potter thunderbolt scar: a symbol of strength, courage, individuality and life. Amy Oestreicher is a PTSD peer-to-peer specialist, artist, author, writer for Huffington Post, speaker for TEDx and RAINN, health advocate, survivor, award-winning actress and playwright who is sharing the lessons learned from trauma through her writing, mixed media art, performance and inspirational speaking. As the creator of the Gutless & Grateful, a one-woman autobiographical musical, Amy has toured theaters nationwide, along with a program combining mental health advocacy, sexual assault awareness and Broadway Theatre for college campuses and international conferences. Her original, full-length drama, Imprints, premiered at the NYC Producer's Club in May 2016, exploring how trauma affects family as well as the individual. To celebrate her own “beautiful detour,” Amy created the #LoveMyDetour social media campaign, to help others cope in the face of unexpected events. "Detourism" is the subject of her TEDx talk and upcoming book, My Beautiful Detour, available December 2017. As Eastern Regional Recipient of Convatec’s Great Comebacks Award, Amy has contributed to over 70 notable online and print publications, and her story has appeared on NBC's TODAY, CBS and Cosmopolitan, among others. She has devised workshops for conferences nationwide and presented at the 2016 Northeast Region WOCN Conference, and is the 2016 keynote speaker for the Hawaii Pacific Rim International Conference on Diversity and Disability. To learn about the art of navigating beautiful detours and to sign up for updates visit amyoes.com.